We are so much more than just specialists in Acai, Espresso, Protein and Raw Treats. For vegans and vegetarians, gym goers and paleos and of course for the ever growing number of those who are simply health conscious. Our menu is extensive but we will endeavour to update this page and add our ingredients lists as new products arrive. Ingredients are based on average typical amounts per serve. Synephrine HCL – a stimulant that is closely related to epinephrine and norepinephrine which are neurotransmitters involved in the fight or flight response. Research has shown that synephrine is a stimulant, thermogenic and assists in appetite control*. The efficacious dosage is 20-100 mg*. Kickstart contains 30 mg’s per serving. Caffeine – a central nervous and metabolic stimulant that is naturally found in coffee beans, tea and guarana. Caffeine has been shown to support energy, thermogenesis, alertness, reduce hunger and fatigue*. An efficacious amount of caffeine can vary from 50-200 mg depending on the individual*. 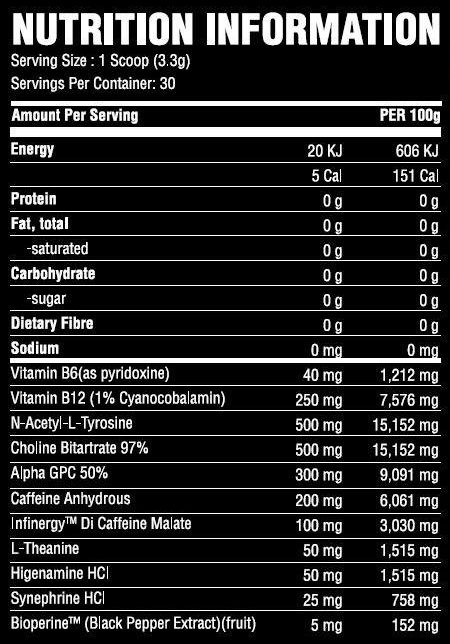 Kickstart contains 175 mg’s per serving. Octopamine – biogenic amine that is closely related to norepinephrine, a neurotransmitter that is involved in the fight or flight response*. Octopamine is a stimulant, thermogenic and may help support fat oxidation*. Kickstart contains 100 mg’s per serving. Evodiamine – a chemical that is found in evodia rutecarpa which has been shown to be a vanilloid receptor agonist similar to capsaicin*. Supplementation may reduce fat uptake, raise core temperature, increase energy expenditure and manage appetite*. Kickstart contains 30 mg’s per serving. Vinpocetine – a constituent found in the lesser perwinkle plant Vinca minor. Research shows that vinpocetine acts as a nootrophic by increasing blood flow to the brain which may increase the brain’s supply of neurochemicals*. The dosage of 5 mg has been shown to increase blood flow to the brain*. Kickstart contains 5 mg’s per serving. Black Pepper – also known as piper nigrum, contains piperine a compound responsible for the pungency in black pepper. Consumption of piperine increases the bioavailability of nutritional compounds and may reduce body fat accumulation*. The dosage of 5 mg three times daily is recommended. Kickstart has 5 mg’s per serving. Juniper Berry – known as Juniperus communis is a botanical that has historical use as a spice and to treat ailments such as upset stomach*. It possesses water loss properties which can be used to reduce excessive water retention*. Kickstart has 50 mg’s per serving. Dandelion Extract – known as taraxacum officinale, is a botanical that has historical usage in herbal medicine as a treatment for several ailments such as infection*. In addition, it is a potent water loss ingredient that promotes the excretion of excess water*. Kickstart has 50 mg’s per serving. Uva Ursi – known as kinnikinnick, is a botanical that has been historically used for medicinal purposes because of its antimicrobial properties*. Studies have shown that uva ursi has water loss properties which can promote the removal of excess water from the body*. Kickstart has 50 mg’s per serving. Ingredients are based on average typical amounts per serve and taken directly from the manufacturers packaging. Please be aware that all our raw treats contain traces of nuts as do a range of our products so please speak to a staff member regarding any dietary requirement. Our “Performance Drink Range” is intended for healthy adults over the age of 18, if you are currently taking any medication and or are pregnant and or have any health aliments then please consult your Dr or physician before consuming any of our Performance range.